This chapter focuses on storage, processing and distribution or marketing of food in sub-Saharan Africa. It stresses the importance of these functions and shows some of the ways in which they could more efficiently supply consumers with adequate and diversified food, thereby ensuring physical access and enhancing household food security. An efficient post-harvest and marketing chain promotes production and distribution in accordance with consumer needs and ensures that the costs of transfer from producer to consumer are kept to a minimum. In many ecological zones crop production is seasonal, yet household food security depends on a regular and sustainable supply of food throughout the year. Thus an adequate crop and food system is needed, together with efficient processing and distribution of foods, to ensure equitable and adequate supplies at the national, district and household levels. Intervention points to improve food distribution and food and crop storage are identified in Box 25. In general, potentially effective improved post-harvest technologies for grains have been identified. In future, the focus of post-production activities for grains should be on adapting the new technologies to specific environments and ensuring that they are economically and socially viable. For other crops, however, there is much potential for further technology development at the level of small- and medium-scale enterprises. For example, there is scope for derivation of new products with market prospects from traditional crops such as sweet potato. Households make choices on how much to store and how much to sell depending on the market price, their own consumption needs, storage facilities and their needs for immediate cash. If the local distribution and marketing system is efficient, they can rely on food being available for purchase all the year round, but if they are isolated for at least part of the year through bad roads and lack of transport, their food security will be more at risk and home storage is likely to receive higher priority. A good marketing infrastructure, maintenance of rural roads and marketing services have profound effects on food availability, market prices and physical access to food at the community level. The level of production is also affected by post-harvest prospects, market facilities and market information. Some perishable food crops such as roots and tubers may not be stored at all, but are simply left in the ground until they are needed. Other crops, if they are to be marketed, may be lifted at once and transported to market in fresh condition. Although in many countries central planning of production is now a thing of the past, there is still a need to orient producers on the needs of consumers. Inadequacies in information about demand, concerning quantity, location and product requirements, frequently lead to misallocation of resources and loss of markets. Under central planning or State purchasing arrangements the cost of such misallocation was absorbed by the government, but under a liberalized market system it is the farmer who suffers. The greater availability of market information should permit farmers to make more informed decisions about what and when to plant. · ensuring availability of midday meals, subsidized canteens or rations for labourers. · educating people about safe and hygienic food storage at home. Roots, tubers, bananas and plantains account for some 40 percent of total food supplies (in terms of food energy) for about one-half of the population of sub-Saharan Africa, where overall food supplies are at very low levels. Production could be increased to meet future needs, although consumption has been tending to decline. The decline has been associated with increased urbanization, which does not favour highly perishable and labour-intensive products. Further research into converting starchy roots into less perishable and more convenient food products for the urban population could help reverse these trends (see also discussion of urbanization in Chapter 4). Most farming families adjust their production of perishable products such as roots and tubers to minimize post-harvest risks. Women farmers in the North-West Province of Cameroon produced potatoes as a cash crop but limited their production to the estimated quantity that could be marketed before the roads were closed by the onset of the rainy season. The producers believed that they could not store potatoes through the rainy season when transport was impossible. If a bumper harvest resulted in low prices or if they were unable to get all of the crop to market, they left the surplus in the field to rot This transport constraint to increased production was overcome, to some extent, by improved storage (see Box 26). Fresh cassava tubers, once harvested, deteriorate rapidly and therefore are best left unharvested until needed. Sweet potatoes and yams, however, exhibit a period of dormancy, and their storage life can thus be extended by curing (see Box 27). Alternatively, yams, cocoyams and cassava may be stored in underground pits after harvesting. In a study in southeastern Ghana (Box 28 and Table 32), 91 percent of farmers surveyed practiced underground storage of unharvested cassava, but only 5 percent of the respondent households used this technique for yams. In the highest areas of northwestern Cameroon, potatoes were grown by women farmers as a cash crop. The major crop was harvested in July, but thereafter followed a two-month period of heavy rains during which time the traders did not come to the villages to buy potatoes because the tracks and roads were largely impassable. The village women, with no experience of successful potato storage, had no means of bridging the gap until late September or October and thus harvested and marketed potatoes in July at the low prices typical of a glut period. The remainder would be left in the field to rot. A two-year project under the Special Action Programme for the Prevention of Food Losses therefore allocated resources to pioneer potato storage, and an experimental store of 7 tonne capacity was constructed using local materials. The store employed a temperature regulation system based on natural nocturnal ventilation. Initial results were encouraging; potatoes were successfully stored and marketed after the rains when prices were higher. Adequate preliminary analysis ensured that this project took a step away from the narrow approach to storage. Storage was seen as part of the post-harvest continuum, a link in the production-storage-marketing-consumption chain. It was seen as a means of overcoming what was essentially a transport constraint. The project also demonstrated that the yields of the local variety of potatoes could be trebled by planting improved seeds which were readily available from the local research station at Bamui. There was little doubt that production incentives were being constrained by post-harvest factors which successful arrangements for storage and marketing would overcome. Source: Adapted from FAO, 1987. Fresh cassava tubers deteriorate rapidly; therefore domestically grown cassava is sometimes left in the ground until the tubers are required for immediate consumption. This is an inexpensive and simple domestic storage strategy, but it imposes a constraint on the effective use of land for subsequent crops and reduces the processing quality of the tubers. Cassava should preferably be processed within 24 to 48 hours of harvesting. If early processing is not possible, fresh, undamaged cassava roots may be stored for a short time by burying them in moist dust or sand. In Kerala, where 85 percent of India's cassava is produced, tests have shown that cassava roots, interlayered in 10-kg lots with cassava leaves, maintain their quality for four weeks. The interlayered cassava leaves not only provide an optimum temperature of 35° to 40°C and a humidity of 85 to 90 percent, but during drying they also slowly liberate small amounts of hydrogen cyanide, which may help to reduce microbial activity in the tubers. In most parts of the tropics, sweet potatoes are harvested as required. Like other tuber crops, sweet potatoes exhibit a period of dormancy, which enables them to be stored for short periods. The storage life of many varieties can be greatly increased by curing. Favoured conditions for curing are relative humidity of 80 to 90 percent, at 30° to 32°C, over a period of four to seven days. Curing promotes wound healing and suberization. Damaged sweet potatoes may become infected with mould, and from time to time outbreaks of poisoning have been reported in livestock fed on the larger coarse-textured varieties. The toxins, called isomeamaranol and ipomeamarone, are believed to be metabolites produced by the growth of a mould on the tubers after superficial damage to the surface layers. There is a tendency to view the preservation and storage of harvested foodstuffs as the duty of women. In fact, they constitute complementary tasks for both sexes in the household. While women are basically responsible for processing most foods for storage, especially vegetables, men are responsible for the tasks of constructing the special storage structures for most of the staple crops. Ayirebi farmers prepare their foodstuffs for storage in a variety of ways, foremost of which is drying. In drying, the objective is to remove as much water from the food item as possible, thereby making it keep longer. The drying process may be conducted directly as in sun drying, where the sun's energy and the wind are utilized to evaporate water from the foodstuff, or indirectly, as in drying over a wood fire. With the exception of maize, yams and rice, there are no specially designed local structures for storage of the food crops grown in the community. Such staples as cassava, cocoyams and some varieties of yams are kept either by delaying harvest until the crop is required or by storing underground in pits. The preservation and storage techniques in use for some selected basic staples among the 412 research sample households in 1983 are shown in Table 32. The post-harvest handling of cereal and legume grains presents different problems. For these crops, the drying stage is all-important, to reduce attack and damage from insects and fungi. In a study on maize losses in Swaziland, by far the greatest loss - around 15 percent - was caused by grain rotting during the field drying stage (see Box 29). One of the recommendations to overcome this problem was to reschedule the school holiday period to enable children to assist the women in timely grain harvesting. This study demonstrates the need to appreciate fully the constraints and strategies of existing farming systems, together with the significance of involving the target communities in the selection and introduction of proposed interventions before changes are introduced. On-farm storage is becoming increasingly important now that the role of marketing boards has been reduced and farmers are having to store much of their surplus on the farm for many months. Traditional grain cribs for maize and other grains, including legumes, are shown in Figure 23. In humid areas, traditional grain cribs are ventilated structures used for both drying and storing grain. For effective drying, the walls should comprise up to 40 to 50 percent open spaces, depending on the relative humidity in the drying area. The maximum width of the crib depends on the mean daily relative humidity; under exceptionally humid conditions the width of the structure should be reduced (see Table 33). The maximum moisture content for safe storage of selected cereals and legumes ranges from 7 percent for shelled groundnuts to 15 percent for beans, with an average of about 13 percent for cereals, as shown in Table 34. It is often not possible to achieve these levels in humid areas. In ventilated cribs losses caused by mould, rats and insects range from 3 to 10 percent. In Swaziland, maize is grown by 94 percent of the farmers and occupies 70 percent of the total cropped area. Swazi farmers produce primarily for home consumption and will sell, when they have a surplus, to deficit families in their own area. Only in good years, perhaps in three years out of ten, is there any substantial surplus for sale in the organized market. Swaziland already had a Food Conservation and Crop Storage Section (FCCS) in the Department of Agriculture, illustrating existing government awareness and commitment to overcoming constraints in the post-harvest sector but indicating that they had assumed losses to be most serious in storage. As well as developing improved grain storage at both farm and cooperative levels, FCCS, with external assistance, developed an improved maize drying crib and was concentrating on introducing this to farmers. FAO and its Special Action Programme for the Prevention of Food Losses supported both these programmes of work and undertook detailed loss assessment of the proposed interventions. The maize loss assessment survey found average losses of 23 percent in drying and storage, of which by far the greatest loss was attributable to rotting of grain in the field drying period (~15 percent) prior to placing maize cobs in cribs for further drying and storage. Considerable loss reduction would be achieved by earlier harvesting and drying, but a shortage of family labour precluded this. The survey threw serious doubt on the usefulness of cribs when early harvesting does not take place. The project's socio-economic survey covering 866 households found among other things that women were heavily involved in all aspects of maize handling and that harvests were frequently delayed to allow the participation of children during their school holidays. The following recommendations were based on this finding: "Early harvesting is important if major post-production food losses are to be avoided. As harvesting is done mainly by the women and children, the FCCS Section should reorient its extension efforts more directly to this target group. Early harvesting could also be promoted by giving school holidays in April. Beginning the first term in early January would still provide the required 62 to 65 days of schooling. The term should end in early April thereby releasing the children to assist their mothers with harvesting and storage. Early harvesting would also enable the cultivation of a second crop since the winter rains are generally sufficient for quick growing leguminous crops". Thus the better loss assessment surveys, which broadened their scope to look at the whole post-harvest system, provided the justification for a more radical imaginative approach to the reduction of post-harvest losses. In the Ebli-Va, the traditional maize storage structure of Togo shown in Figure 23, maize cobs are placed on top of each other on a platform to form a circular wall. To allow for good fitting, the cobs have to be of uniform size. Sometimes the cobs are also slightly wetted to improve adhesion. After the wall has been made, bulk maize is poured inside the wall and the whole structure is closed with a thatched roof. If the platform is sufficiently high, a fire can be lit under the structure for insect control by natural fumigation. The smoke enters through holes in the platform and escapes through the roof. Thus the wall must have few openings, so the structure will function as a chimney. In arid zones grain may be dried in the field, on the stalk, spread on mats or bags along the roadside or on threshing floors made for this purpose. The dry grain is usually stored in solid-walled silos or bins built with local materials or cement. If the grain is to be used for daily consumption and is initially dry and insect free, the use of insecticides is often not cost effective or necessary, as storage time will probably not exceed six months. Cow dung, which is used in the plaster of traditional silos, has insect-repellent properties. In some areas leaves of neem (Azadirachta indica) or small quantities of palm oil or groundnut oil are added to the stored grain as an additional protection. Well-maintained silos offer a high degree of security against rodents, birds and insects. Storage problems may sometimes arise with the introduction of new, high-yielding varieties. Traditional crop varieties are often more resistant to storage pests than improved varieties. In eastern and southern Africa maize was introduced as a cereal crop and gained rapid acceptance. Under suitable climatic conditions and through the use of intensive cultivation techniques, it has been possible to realize much higher yields for maize than for indigenous grains such as millets and sorghum. Maize is resistant to bird damage in the field, although some improved varieties present problems in storage. Some high-yielding varieties have a larger cob which is less tightly bound by its sheath than the cob of the original introductions. In traditional maize storage structures the grain is stored on the cob in maize cribs. High-yielding hybrid maize is much more susceptible to insect attack, which leads to higher storage losses in these traditional structures. In a cost-benefit analysis in Zambia, the potential of building improved solid-walled bins to store the new grain varieties proved unconvincing (see Box 30). Thus the nutritional benefit to poor consumers of the introduction of high-yielding varieties is not a straightforward issue of increased yields. Among cereals, the harder the grain the more resistant it is likely to be to pest attack. Traditional practices of storing unthreshed grains offer increased protection. For example, paddy rice is more resistant to pests than milled rice, and under village conditions, where fumigation or airtight storage is impractical, cowpeas are better stored unthreshed, as the intact, dry pods provide some protection against bruchids. Good husk cover can reduce field infestation in maize but only marginally reduces the rate of pest increase. Where possible, post-harvest improvements in developing countries should be relatively simple and inexpensive. For small grain stores, simple improvements to make existing structures secure against rats and vermin and to facilitate the application of insecticides may be more appropriate than the construction of new, more sophisticated stores. In Zambia, the rain-fed maize crop was harvested once a year and therefore had to be stored for nine to 12 months for family use. About 65 to 70 percent (1 million tonnes) of the production was retained on the farm and the rest was handled by the National Agricultural Marketing Board. At farm level, the maize was stored on the cob in cribs. Each family stored about 1 to 2 tonnes for home consumption. No large-scale survey of storage losses of maize had been conducted, but a limited survey carried out earlier on selected farms showed a weight loss of 13 percent. The problem of storage loss was conceived to have increased with the introduction of hybrid maize varieties which are highly susceptible to insect attack in storage. FAO and the Special Action Programme for the Prevention of Food Losses trained extension workers and organized a series of demonstrations on how to build and use improved solid-walled bins (ferrumbu) which had been locally developed and tested for their technical performance but mainly under research station conditions. In 1983 and 1984, as a follow-up, a technical loss assessment exercise and a socioeconomic survey were undertaken to evaluate the efficiency and appropriateness of the bins that had been already installed as demonstrations on farmers" premises. Reductions in storage losses in the new structures were not convincingly demonstrated. The cost-benefit analysis suggested that purely financial benefits would only be substantial in the short term to farmers who could avoid buying the equivalent of two bags of maize as a result of improved storage practices. This was equivalent to a 10 percent reduction of storage losses. An appropriate innovation may be defined as one that resolves what is perceived as a key constraint in a traditional system at an affordable cost and yields substantial benefits without involving unacceptable changes in practices. The appropriateness of the new solid-walled bins in terms of the above definition was not comprehensively demonstrated. The improved cribs shown in Figure 24 are well ventilated, allowing harvest at high moisture content. (Early harvest also reduces field losses.) Metal baffles fitted on the crib legs can protect against rodents by hindering their access. Ventilation more or less eliminates the mould problem, but there may be superficial germination in very wet conditions. Husks must be removed because of the high moisture content, and their removal exposes grain to insect attack; insecticide treatment - dusting or spraying is therefore necessary in most localities. Insecticides admixed initially tend to break down rapidly, but they can be reapplied, at least to the outside of the crib. Penetration is thus improved. The capital cost of such improved cribs is low to moderate, depending on the materials chosen. The durability of the cribs also depends on the materials. The recurrent cost is the pesticide. Promotion of storage of cereals in solid-walled bins should also be accompanied by the introduction of improved shelling and threshing techniques, since in the bins cereals are stored in bulk. Hand shellers are too slow for the processing of large quantities of grain. An FAO project in the United Republic of Tanzania tested two manually driven maize shellers. By pressing the maize cobs against a rotating disc with spikes on both sides, it was possible to shell two cobs simultaneously. A bevel-shaped stripping wheel provided a rotary motion to the cob, ensuring an almost complete removal of grains. However, the manually driven shellers were not effective enough for village-level operations. Instead, small-scale farmers preferred to use hired labour to shell by hand, which proved to be more cost effective. These studies illustrate the importance of examining the impact of changes on the whole food system from the point of view of the producer and the consumer. Labour costs at each stage must also be considered. Despite stringent quarantine regulations, the introduction of new crops can also introduce new storage pests which render traditional storage structures inadequate. An example is the large grain borer in Tanzania (see Box 31). Traditional post-harvest grain handling and storage practices may need to be modified to reduce damage by such pests. Good storage practices are summarized in Box 32. The larger grain borer, Prostephanus truncatus (Horn), is a storage pest from the southern United States and Central America which was accidentally introduced into Tanzania during the late 1970s. By the mid-1980s, the larger grain borer had spread into 17 of the country's 20 regions. It can cause weight losses in farm-stored maize and dried cassava which are several times higher than losses caused by indigenous pests. After five months' storage, mean weight losses of 9 percent were found in maize, a much higher level than the losses of less than 1 percent which would be expected in areas of East and Central Africa that are free of larger grain borer. A multi-donor-funded control and containment campaign coordinated by FAO, with aid-in-kind provided by the United States, the United Kingdom and the European Economic Community (EEC), recommended shelling the maize from the cob as soon as possible after the harvest, treating it with specified insecticides and storing it in a container which minimizes the risk of subsequent insect and rodent attack. These recommended practices are new to many small-scale Tanzanian maize growers who normally dry and store their maize on the cob in structures that have been adapted over many years to local conditions and customs and are constructed from locally available materials. The adoption of the recommendations involves small-scale farmers not only in major socio-economic changes but also in new untried (for them) practices of immediate shelling and the use of modified storage structures. The farmers' response to the extension message has varied widely, but the impact has been significantly greater in those communities in which there has been an extension push. An attempt to measure the effect of the recommendations on maize storage losses showed that when food removals for home consumption or for sale throughout the year were taken into account, the real food loss during a season was less than 2 percent. Compared with the mean of 8.9 percent weight loss when spot estimates were obtained in 1984, these losses were very low. The programme has increased awareness at all levels of the seriousness of the larger grain borer problem, and during its course government support and participation increased more and more. In most areas there is full support from the administrative and political leaders, and the legislation introduced to facilitate containment and control has contributed much to the present results. A distribution system for pesticides has been set up and sales are monitored. Government inspectors, extension staff and village officials have been trained in the correct control methods. The following points represent a suggested code of good storage practice, and thus offer a set of guidelines in the adoption of an appropriate storage system. · Dry grain well before putting it in storage. The grain must be kept dry. · Put only clean grain into containers which themselves have had all old grain, dust, straw and insects removed and burned, for they could recontaminate the new crop. · Keep the grain cool and protect it from large changes in outside temperatures. This can be done in a number of ways - by using building materials (e.g. brick, mud, clay, wood) which do not easily pass on changes in outside temperatures to the stored grain, by keeping or building storage containers away from direct sunlight or by applying a coat of white plaster to the outside of the containers. · Protect the grain from insects by following the rules for cleanliness and drying and putting the grain into an insect-proof store. · Waterproof the buildings and containers as much as possible when the building is constructed. Storage buildings should be built on well-drained locations and not where they will be flooded by groundwater runoff during heavy rains. This can be achieved by raising the floor of the building off the ground. · Make sure containers are rodent-proof in all possible ways. · Check the grain regularly while it is in storage to make sure it is not infested. The farmer should put his hand into the grain to check for heating and should also smell the grain and look for dark kernels, signs of mould, which indicate that the moisture content is rising. If these signs are found, the grain should be tipped out and dried again. · Provided they are used in accordance with the manufacturer's recommendations and conform with local government regulations, insecticides mixed into the grain prior to storage may be used to control infestation. Community storage for improved household food security (see Box 33) can be very effective, especially in remote areas where people do not have ready access to markets, in areas where markets are not functioning properly or in areas that are periodically threatened by drought-induced food shortages. Cereal banks, if managed effectively, can provide a safety net, especially for poor farmers. Farmers can then sell surplus food immediately after the harvest to buy household necessities, to pay children's school fees or to repay input loans for seeds and fertilizer. They can also purchase needed food at the lowest possible price before the harvest period when food is scarce and market prices are high. Food security is sometimes jeopardized by badly organized marketing and distribution. The parastatal cereal authorities frequently only serve the interest of urban consumers and may find it almost impossible to distribute grain in times of deficit to remote villages where there are no proper roads or storage facilities. In Burkina Faso, some non-governmental organizations took the initiative of creating food supply mechanisms at village level. Known as "cereal banks", they are essentially storage organizations managed by the small farmers themselves, who are responsible for purchasing the cereal immediately after the harvest, storing it and selling it back to the villagers at the lowest possible price in the period of shortage. Although these cereal banks were set up in marginal and deficit areas, in normal production years, the villagers - or at least some of them - had a certain surplus and others sold part of their meagre harvest because they needed cash. The cereal banks ensured that cereals offered for sale did not actually leave the village, and savings were made on the cost of transport since cereals were purchased in the place where they were stored and distributed. Naturally, there had to be some organization, some storage infrastructure (small warehouses) and financial resources for the stocks, and villagers had to be trained to take over these new responsibilities. FAO's Special Action Programme for the Prevention of Food Losses was closely involved in these aspects and simultaneously encouraged the prevention of losses from the cereal banks through improved storage and handling techniques. Cooperative activities may provide one of several alternative channels through which post-harvest information can be extended to clients. Very likely, individuals will have an incentive to improve post-harvest methods in their own home. Mycotoxins are chemical substances that contaminate various agricultural commodities, either before or after harvest. Of these, aflatoxins are produced by the moulds Aspergillus flavus and Aspergillus parasiticus, which infect drought-stressed maize and groundnuts in the field. They also infect these crops and many others, including copra, cottonseed, pepper, other cereals, nuts, oilseeds, legumes and certain dried fruits, when the crops are handled improperly and stored under inadequate conditions. The toxic aflatoxin M1 can occur in milk from dairy cows fed contaminated feed. Aflatoxins have been observed to cause liver cancer in laboratory animals. Together with the hepatitis B virus, they are seen as cofactors in the high incidence of primary liver cancer in tropical Africa. Chronic low-level exposure to mycotoxins may result in serious debilitating effects, especially for malnourished individuals. Animal studies indicate that youth and poor nutrition increase susceptibility to aflatoxins, as do certain specific vitamin and trace metal deficiencies. Protein supplementation of the diets of aflatoxin-exposed animals reduces toxicity. A speculated causal relationship between aflatoxin intake and the development of symptoms of kwashiorkor in malnourished children remains unproved despite considerable supportive information (Hendrickse, 1988). International trade in agricultural commodities such as wheat, rice, barley, maize, sorghum, soybeans, groundnuts and oilseeds amounts to hundreds of millions of tonnes each year. Many of these commodities carry a high risk of mycotoxin contamination. Regulations on mycotoxin levels have been set by the Codex Alimentarius Commission and are enforced by most importing countries. Economic losses arising from the export of mycotoxin-contaminated food and feed are often very considerable. In domestic markets economic losses occur at various levels, from the commodity producers to the brokers, the processors and the animal producers. Losses can be reduced by following good agricultural practices during pre- and post-harvest handling. Avoiding water stress, minimizing insect infestation and reducing inoculum potential are effective countermeasures, but it is often not practical for farmers with limited resources to implement them. The adoption of appropriate drying techniques, the maintenance of proper storage facilities and care not to expose the grains or oilseeds to moisture during transport and marketing can also help to reduce risks of contamination (see Box 34). Contamination and subsequent losses are often greatest at the national level, when the capacity for bulk transportation and storage of basic grains proves inadequate to meet the needs of a centralized distribution system. Prevention of attack by fungi, insects and other pests is of prime importance in post-harvest storage. The basic principles of grain storage are relatively simple. First, the product to be stored should be conditioned to a stable state in which respiration of the seeds and of associated microorganisms are reduced to a minimum. This is achieved by keeping the moisture content of the grain and the ambient humidity very low. Second, the product should be placed in a container or structure that will maintain a suitable environment and prevent or restrict the entrance of insect and animal pests. Last, the grain should be accessible throughout the storage period for additional treatment if necessary to maintain good condition, particularly with respect to heating and moisture absorption. Since in many cases agricultural crops are seasonal, they must be stored from one season to the next. In rural areas, individual farmers have their own storage structures in which the grains are stored. The storage structures vary in construction type, size and materials used. Above-ground structures range from cubicles and small rooms to large warehouses. Masonry bins, wooden cubicles, straw and bamboo structures, and clay containers of baked and unbaked materials are used in the developing countries. For commercial purposes, storage structures may be silo-like elevators, large-scale bulk storage warehouses or bag-storage go-downs. In order to prevent losses in quality or quantity, the product (crop) must be protected from insects, rodents, mould and biochemical deterioration. Protection from mould has become very important as a result of increased awareness of the hazards of mycotoxins to human and animal health. Temperature and moisture control are important considerations for prevention of moulding. Insect control is also important since insects may cause high-moisture pockets in the stored product, create sites for mould infection by penetrating the product and carry mould spores to infection sites. Processed products such as flour, meal and groundnut cake must be protected during storage since viable mould spores are present and if conditions are favourable for mould growth, mycotoxin may be produced. Foods are processed to improve their digestibility and to enhance their appeal to the consumer. Processing also serves to extend the availability of foods beyond the area and season of production, thus stabilizing supplies and increasing food security at national and household levels. A particularly important aspect of food processing is that it permits great diet diversity, giving consumers access to a wider choice of products and hence to a better range of vitamins and minerals than they would otherwise consume. The most basic level of processing is food preservation, which in a variety of forms has been practiced by families in traditional societies for generations to provide food when sources of fresh food are scarce. In many societies, however, and in Africa particularly in urban areas, many people now have access to more convenient commercially processed foods, and many of the traditional ways of contributing to household food security are dying out. This is not necessarily a desirable trend. Village-based processing includes basic transformation activities such as milling as well as processing of products for which there is a potential market. Such processing, which can be done on an individual or group basis, provides employment for millions of rural people and is often one of the sources of income for rural women. The preparation of gari, a dried fermented cassava product, in West Africa and the smoking of fish in Ghana are examples of such processes, which transform highly perishable commodities into products that can be transported long distances and stored. Village groups, often with the support of donors and non-governmental organizations (NGOs), are now processing fruits and vegetables themselves. Where such ventures have been designed to preserve crops that would otherwise be discarded so that they can be consumed after the fresh season is over, few problems occur. Where village-based processing is designed to provide cash incomes, however. such schemes have often run into marketing problems because of a lack of management and marketing expertise and the failure to research the potential markets adequately. On a larger scale, agro-industries convert commodities into processed foods which are usually more stable and more marketable than the raw, untreated commodity. They can thus make available certain types of food, e.g. animal protein, often at low prices, to consumers who would not otherwise have access to them. They can also ensure year-round availability of seasonal, perishable products and provide food in a more convenient form than the raw material. Where urban populations require processed foods in large quantities, mechanized processes with high output capacities are generally efficient and economic. Widely dispersed populations, on the other hand, may be better served by smaller-scale technologies. Food processing industries may be concentrated in urban centres or spread among rural communities where they offer the twin advantages of processing perishable crops and animal products close to their source and providing income for rural people. Primary processing refers to the immediate post-harvest handling activities. For cereal and legume grains, such activities include drying, threshing or shelling. Such operations reduce the fibre content and may extend the storage life of the foodstuff. Tertiary processing involves the conversion of uncooked materials into products and food combinations for human consumption. The processing may take place at a commercial level, as in the extrusion cooking of cereal-legume mixes or the production of commercial weaning foods, or at the domestic level in the preparation of family meals. 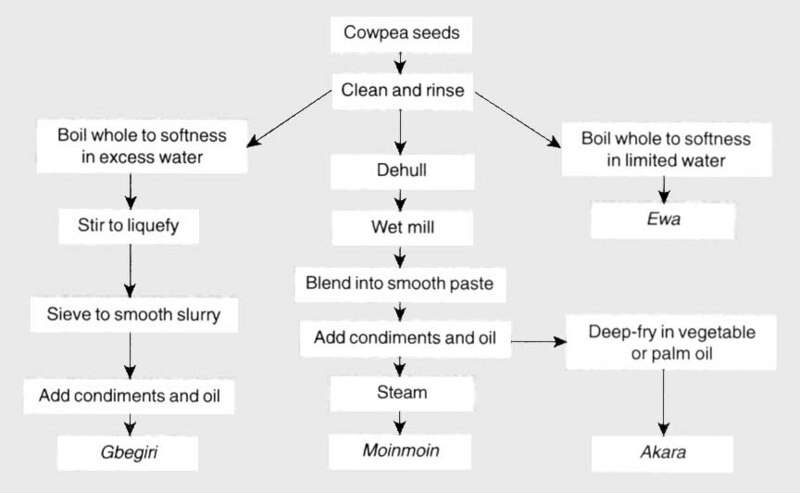 Figure 25 shows methods of processing for some cowpea products prepared in Nigeria as snacks for street food sale and for household consumption. Food spoilage may be reduced by controlling the availability of water to the organisms causing the spoilage and/or by lowering the pH of the food (see Box 35). The most common preservation technique practiced at household level in the tropics is sun drying; its importance for grain storage has already been emphasized. Drying is also often used to preserve meat and fish, fruits, roots and tubers and green leafy vegetables. The preparation of cassava flour from dried cassava is described in Box 36. Banana flour may be prepared in a similar manner. Source: Akinyele, 1989. Reprinted with the kind permission of Butterworth-Heinemann Journals, Elsevier Science Ltd. The Boulevard, Langford Lane, Kidlington 0X5 1GB, United Kingdom. Foods may spoil in many ways: by internal reactions between components, by reactions of the components with water and air, or by the enzymic and toxic effects of growth of microorganisms. The purpose of food preservation is to reduce the extent of deterioration by interfering with those reactions and slowing down the rate of growth of undesirable microorganisms. That purpose may be achieved by raising or lowering the temperature or the pH of the substrate and by controlling contact with water and air. Water control is one of the most effective methods of reducing deterioration. It is most simply practiced by drying the food and reducing its water activity, as measured by relative vapour pressure. Vapour pressure is also reduced by the addition of salt or sugar. At low water activities, biochemical reactions and microbial activity are greatly restricted; extremes of pH have a similar effect, and many traditional processing methods are based on lowering the pH of the substrate, followed by heating or drying. Cassava and banana may also be preserved by fermentation, followed by drying. The preparation of gari is outlined in Box 37. The preservation of ensete, a banana-type plant, is described in Box 38. In eastern Africa, cassava flour may or may not be fermented, and it is rarely consumed alone; the normal practice is to add varying proportions of it to a cereal such as sorghum or millet. The preservation of leafy vegetables by sun drying is described in Box 39. In order to retain as much of the vitamin content as possible, the use of solar dryers is recommended (see also Chapter 5, Box 24). Pre-blanching of leaves and drying away from direct sunlight are also beneficial. Fresh cassava roots are peeled, washed well, cut into large longitudinal strips, and thoroughly dried in the sun. These dried, split cassava strips are an important market product in Ghana, where they are called kokonte. They are a common sight drying on housetops, on small platforms, on the ground and along the edges of roads. The final product is light in weight and more or less white, depending on the care with which it has been prepared. Frequently, the surface is discoloured by fermentation and by mould infestation during the initial stage of drying. Cassava flour is made from dried cassava slices, either by pounding them in a mortar or by grinding them on a flat stone followed by sifting. It has a grayish-white colour and often has a rather acid and a faintly acrid flavour. The texture varies from coarse to fine, depending on the degree of milling and the extent of sifting. The flour is prepared for consumption by pouring it slowly into a pot of boiling water over a fire and continuing to cook it until the mixture forms a glutinous, translucent paste. The colour of the cooked product varies from cream to greenish-brown, depending on the mould infestation. In the Congo, cassava flour paste, called ziga, is an important local food. Usually it is allowed to cool and harden before it is eaten. It may be further processed by roasting or frying in coconut oil to make a variety of snack foods. A product called mokale is prepared in this way from a mixture of cassava and groundout flour. In Uganda, banana flour may be added to the cassava flour during the paste preparation. Cassava flour may be baked into a hard, flat bread, but the acceptability of such products depends on the quality of the flour. If it has high fibre content, it will adversely affect the texture of the product. Some varieties of cassava yield a flour with an acrid, bitter after-taste. Gari is produced at the household level in many Nigerian villages. The most common procedure is to harvest a few roots at a time so that they may be processed before they spoil. After cleaning and peeling, the roots are grated on a sheet of roofing iron roughened on one side by piercing with a large nail. The grated pulp is put into a cloth bag, which is tightly tied between wooden poles, and the bag is then set in the sun for the pulp to drain and to ferment. Heavy stones and logs are piled on top of the bag to press out the moisture. Drainage is slow, and it is necessary to leave the grated roots under pressure for three or four days. As a result, a certain amount of fermentation and souring takes place, which gives the product its characteristic flavour. After drainage is complete, the meal is removed from the bag and sieved on a flat sitter made from palm fibre. The sieved material is placed, a little at a time, in wide, shallow metal pots over a wood fire. It is continuously turned and stirred; a lime palm oil may be added to prevent burning, and lumpy sections of the meal are beaten to disintegrate them. This method produces a cream-coloured product known as white gari, which has a better nutritional value. The final product, it carefully prepared, will keep for weeks or months depending on how well it is packaged. Production of gari has been mechanized in some West African countries, notably Nigeria and Togo. Use of hydraulic presses means that all the moisture can be expressed from the meal in a few minutes and no fermentation occurs. This product was initially considered to be tasteless by consumers accustomed to the traditional preparation, and the texture was considered to be too uniform. A modified process, involving a rapid fermentation initiated by inoculation with a starter culture, has now been introduced to improve the acceptability of the product. Cultivation of ensete (Ensete ventricosum), also known as false banana, is limited to Ethiopia, where it is a staple food crop of the people of the Gurage and Sidamo areas in the southern highlands. The parts of ensete prepared as food vary from place to place, but they generally include the starchy portions of the pseudo-stem pulp (which may be boiled fresh as a vegetable), the young shoot, the trunk of the tuberous rootstock and in some cases the upper part of the root. The young root may be cut up and cooked like a potato, but the other vegetative materials are usually pulverized and fermented in a type of silage pit for periods ranging from a few weeks to several months before consumption. The circular pits are about 1 m in diameter and about 1 m deep. They are lined with ensete leaves and filled with the starchy portions of the "stem", selected for fermentation. The top is covered with another layer of leaves and weighed down with heavy stones. After three or four weeks the pit is opened and a starter from a strongly fermenting order silo is added to accelerate the fermentation. After a further period of several weeks the silo is again inspected and its contents are rearranged to give an evenly fermenting mixture. The ensete is ready for use after three to four months but can also be kept for one year or more. Some leafy vegetables are preserved for use in the dry season by sun drying. Slippery mucilaginous vegetables, such as okra, are never blanched or boiled. The leaves are simply stripped from the stems and dried in the sun. Other leaves may be blanched or parboiled; tree leaves may also be pounded to soften them before drying. Dried baobab leaves are particularly appreciated. The dried leaves may be added directly to soups and stews as required. Dried cowpea leaves may be fried, as well as boiled. They can be fried in oil, crumbled and sprinkled over maize porridge as a relish. During drying, nutrients such as vitamin A and ascorbic acid are often greatly reduced. The extent of the vitamin loss depends on the pre-treatment and the temperature and duration of the drying process. Fish and meat may be preserved by salting, smoking and drying. Some types of fish are also fermented. Table 35 lists the major cured fish products of Senegal and their processing methods. The fermented product guedj is prepared by stacking unsold fresh fish in heaps in the open air for 24 hours. During this time some fermentation occurs because of enzymes in the fish viscera as well as bacterial contamination. After stacking, the fish are eviscerated and large fish are filleted. The fish meat is then soaked in sea water in wooden buckets. The water is changed weekly when it becomes foul. Finally, the partially fermented fish is spread on straw for two to four days to dry in the sun and wind. The traditional preservation of meat by salting, smoking and drying is outlined in Box 40. Milk may also be preserved by combinations of fermentation and drying (see Box 41). Different forms of processing may alter the nutrient content of foods (see Box 42). For example, nutrients are usually distributed unevenly throughout the different parts of grains, so there is considerable nutrient loss during milling. The effects of processing on the nutritional content of cereal grains are discussed in Box 43. Tables 36 and 37 show the results of different extraction rates on the chemical composition of wheat flour and the influences of different processing methods on the nutrient content of milled rice. Although fresh meat is preferred when available, dried meat is prepared to ensure a supply to distant markets and to preserve meat that is not required for immediate consumption. A combination of sun and air drying is the most common technique for the preservation of meat from domesticated animals. Game, and the meat of small rodents, is often dried and smoked in situ over a log fire. Biltong is a traditional dried meat product of southern Africa which is prepared by air drying salted meat strips. Lean meat, usually beef or game, removed from the larger muscles of the hindquarters, is cut along the grain into thin strips about 20 to 30 cm long and 2.5 x 4 cm in section. The strips are rubbed with dry salt (2.5 to 4 percent) mixed with spices, including allspice, coriander, pepper and garlic. Sugar is also added, which helps to counteract the toughening effect of the salt. The prepared strips are left for several hours for the salt coating to penetrate and are then air dried for one to two weeks, to a water content of 10 to 15 percent. Lean biltong is microbiologically stable below a moisture content of 24 percent. Some surface spoilage may occur by contamination with moulds and yeasts, but aflatoxin production is not a problem as the water activity is too low for the development of Aspergillus flavus. Biltong may be attacked by beetles from four to six weeks after drying. Smoking of biltong increases resistance to beetle attack for about three months. In some North African communities, dried camel meat is similar to that used for biltong. Smoking of meat is often combined with drying; most cured meats are smoked to improve their flavour and appearance and to increase their storage life. In Ethiopia, a type of yoghurt, called ergo, is prepared by incubating milk at room temperature for two days in a vessel that has been smoked with olive wood. Butter and buttermilk may be produced by churning ergo which has been fermented for four to five days. The fluid remaining after removal of the butter is used to make a curd cheese, ayib, by gently heating it for 30 minutes. The curds are strained off, pressed and served with chicken or vegetable stew and enjera. The whey from ayib cheese is drunk as a beverage. In northern Ghana, the juice from the leaves of Calotropis procera is extracted and used like rennet to precipitate the curds from heated cow's milk. The curds are drained, squeezed and sun dried. A natural red dyestuff that is extracted from sorghum leaves is used to colour the cheese, which may subsequently be further dried and smoked over the cooking fire. This cheese, called wagashi, is usually cut into slices, which are fried in oil and eaten with the addition of chili pepper. Although some whole-grain products may contain a higher percentage of nutrients, this advantage is not necessarily matched by an increase in the amount of nutrients available to the consumer. A high fibre content in the diet reduces the efficiency of digestion of starches, lipids and proteins. In addition, the phytates associated with the fibre of cereal grains may interfere with the absorption of calcium, iron and zinc. This consideration is particularly significant for young children who may find it difficult to digest and assimilate meals containing bulky cereal and vegetable fibres. The needs of young children in terms of meal composition and frequency are discussed in Chapter 7, as are beneficial aspects of fibre in adult diets. Milling may reduce the amount of fat, protein and fibre and increase the proportion of starch. Fermenting and malting alter the proportions of starch and sugar. Fermenting may add alcohol. Bottling and canning may add sugar. Frying increases the fat content. Cooking at very high temperatures can spoil fats and proteins. · frying for a long time or at high temperatures. Vitamin A is increased by fortification. Thiamine decreases when rice is washed. Riboflavin decreases if milk is left in daylight. · cooked long before eating. Vitamin C increases when seeds (for example, of legumes) germinate. Fortification may increase the amount. For example, salt may be fortified with iodine. Fermentation and germination increase the absorption of non-haem iron and other minerals. Drying foods reduces the water content and so increases the concentration of other nutrients. Milling and cooking break down cell walls so that nutrients are digested more easily. Source: Adapted from King and Burgess, 1993. · the removal of the outer layers of the grain, which may be desirable although causing a loss in some nutrients (for example, tannin is concentrated in the outer layers of sorghum and its removal is nutritionally essential, and the milling of brown rice to white rice produces a product which is far easier to prepare). Source: Adapted from UNIFEM, 1988. Source: Adapted from FAO, 1970. Germination or malting of grain provides a convenient method of increasing the energy density and digestibility of infant foods. During germination, starches are degraded by amylase into dextrin and maltose. These smaller molecules absorb and hold less water than starches. When porridge is prepared from ground, malted grain, it is thinner in consistency than normal porridge made with the same concentration of unmelted flour. It is therefore possible to increase the energy content of malted grain porridge without making it too thick, and children can digest it more easily. In some food preparations germination is combined with fermentation to produce a sour, malted flavour, which is preferred in many communities (see Box 44). In most African countries women are largely responsible for food processing. At harvest time they undertake the threshing, winnowing, drying, husking and shelling required to prepare the grain, and in almost all cultures they are in sole control of grain storage. Whole grains store better than ground flour, so many rural women grind and pound small amounts of grain every day for immediate family consumption. The tasks of pounding, winnowing and grinding are often tiring, monotonous and time consuming; output is estimated at 1 to 3 kg of sorghum or millet flour per woman per hour (see Box 45). Box 46 outlines the process of parboiling, winnowing and milling paddy rice. The method is very slow and laborious, and output rarely exceeds 5 kg per worker per hour. Maize may be milled either wet or dry; these techniques are described in Box 47. In Africa, germination and fermentation are traditional practices in the preparation of cereal porridges. These techniques improve the flavour and digestibility of the product. In Uganda, a thin porridge called obushera is popular; it is prepared by using germinated fermented grain flour. The millet or sorghum is mixed with wood ash and water; it is then left to germinate and ferment. This process produces enzymes which partially break down the grain starch. Acid-forming bacteria grow on the substrate during fermentation. The grain is subsequently washed, dried and ground to a fine flour which may be cooked with banana paste, crushed sesame seeds and sugar. The combined germination and fermentation improve the digestibility of the cereal and increase the content of vitamins in the prepared food. The initial enzymatic changes, which precede germination, result in both transfer and increase of the B vitamins and, at the same time, somewhat break down the higher carbohydrates and other storage molecules such as calcium magnesium phytate. As a result of these changes, it is possible to produce a more nutritious flour with a low fibre content. Fermented, malted cereal pastes are less glutinous and sticky than those prepared from the unmelted grain, which is an important factor in preparing food for infant feeding. The digestive capacity of infants is limited. Therefore, it is desirable to provide for them a weaning food of high energy density. The energy content of porridge or gruel can be increased by using malted grains without a corresponding increase in its viscosity. Numerous attempts have been made to introduce improved technology into traditional food processing to reduce the labour demands on women. Sometimes these measures have worsened the situation of women instead of improving it, as men have taken over the labour-saving technology to make money and not only have deprived women of needed income, but also have diverted the technology from the purpose for which it was intended. This deviation is particularly noticeable when machinery is introduced at an intermediate scale for community use. Box 48 shows how technological innovation in gari processing in rural Nigeria had the result of pushing women out of this economic activity altogether. The outer layers of certain varieties of sorghum seed contain tannins which are slightly toxic, have a bitter taste and inhibit protein digestion when consumed. For these reasons sorghum is generally dehulled (i.e. the outer layers are removed) and then pounded into flour. Red or brown sorghum continues to be grown in many parts of Africa because of its bird resistance, in spite of the availability of white non-tannin varieties. Traditionally, the processing of sorghum and millet has been carried out by grinding the whole grain in querns [hand-driven stone mills] or between stones or by pounding the grain using a pestle and mortar. The latter process is the commonest method for sorghum. Once the seed has been winnowed to remove foreign matter, it is put in a large mortar and wetted. It is then pounded to strip the bran or shell from the grain, followed by winnowing to remove the bran entirely. Pounding and winnowing are repeated several times before a good-quality milled seed is obtained. The milled seed is then washed with water to remove any small pieces of bran and soaked in water for 24 hours to condition or temper it. This is followed by drying to the correct moisture content and then regrinding with a pestle and mortar. In order to obtain a good flour, sifting and pounding have to be repeated several times. The flour obtained contains a large proportion of the oil-rich germ and the nutrients of the grain. Grains are moistened to facilitate the removal of the bran, but this can result in a slightly fermented flour. Although the keeping quality of this type of flour may be diminished because of femmentation, the resulting flour has a modified flavour which is often considered desirable. The objective of hand-pounding is thus twofold. In the first stage, the bran and pigmented layers are removed, and in the second stage the grain is pounded progressively with intermittent sieving into flour suitable for various end products. Traditional parboiling techniques differ greatly from country to country. In West Africa paddy is frequently parboiled in small quantities in earthenware pots or oil drums after soaking in cold water overnight. · to pre-steam the paddy before soaking, which reduces both the steeping time and the number of microorganisms in the paddy. It is stressed that careful drying after parboiling is essential to minimize post-harvest losses. Dehusking of paddy, which is sometimes referred to as milling, is the process of removing the outer husk. Dehusked paddy is referred to as brown rice. Further milling of the brown rice results in white rice. The most widespread traditional method uses a mortar and pestle. This may be done by one woman working by herself or by a number of women working rhythmically together. Hand-pounding produces an undermilled rice which is of greater nutritional value since it retains part of the bran with high thiamine and also protein content. Hand-pounding also results in a high proportion of broken kernels. Winnowing is carried out at intervals during this process. Maize may be either dry or wet milled. In dry milling, maize is usually ground between stones or by using a small hand-powered plate mill; otherwise custom or cooperatively owned power-driven hammer or plate mills are used. At other times, the grain is milled wet after it has been soaked and allowed to ferment slightly to improve its flavour. In Latin America maize is partially cooked in alkaline conditions to facilitate the removal of bran before it is milled. [As the whole grain is used in this preparation, more of the original nutrients in terms of oil and protein content are retained. In addition, the alkali treatment liberates niacin from its bound form, niacytin, thus improving its big-availability and reducing the risk of niacin deficiency disease (pellagra) in maize-based diets.] Where very small quantities are needed, the wet maize may be ground at home using a saddle stone or similar device. More commonly today, hand- or power-driven plate mills are used either to break the grain roughly or to mill it further to a smoother paste. Maize grain is either pounded using a wooden pestle and mortar or ground by hand on a stone by a quern (a rotating hand-driven stone mill). The amount of maize required for several meals is taken off the cob and transferred to a wooden mortar. One or two cups of water are added and the whole is pounded. If the meal is not used whole, it is transferred into a flat basket and, by shaking, the bran is separated from the floury endosperm. The flour is again collected into the mortar and pounded in the same way as before for three or four shorter periods followed by the traditional separation of the bran. The resulting product is called "pure" and the bran is often used to feed chickens. Some of this "pure" meal may be cooked as it is or together with beans, but most undergoes further processing, starting with soaking in water for one or two days until an odour develops owing to fermentation. Fermentation produces acidic conditions which inhibit the growth of undesirable bacteria. The water is then poured off, the soaked "pure" meal is washed up to three times with fresh water, decanted and again pounded in the mortar. It is then separated, as before, from the finer parts. The bigger particles are kept for further pounding until everything is reduced to a semolina-like flour. This product is ready for preparing into foods such as uji and ugali. It cannot be kept for more than a day; if dried it may be stored for a few weeks. The shelf-life of maize meal is very low because maize has a relatively high fat content, and the meal tends to go rancid quickly. In selected rural villages in Bendel State, where the processing and sale of gari are predominant sources of income for women, the introduction of improved gari processing technologies on an intermediate and industrial scale has had a profound effect on women's income. Traditionally, cassava farms have been ploughed, planted and weeded by men. Few women cultivate their own farms. More often, women buy the unharvested tubers from men and harvest the tubers themselves. The peeling and grating of cassava is done by hand. Gari processing provides the main source of income for women in this area. Diesel-engine-powered mechanical graters and hydraulic dewatering presses have replaced hand grating methods and reduced the time needed for pressing. Because of the high purchase cost of these technologies, only men own and operate these machines. All the men belong to a union which fixes prices for operations and organizes work schedules for members. These work schedules are determined by the number of machines available in any village and the length of market days. Such a system was intended to avoid conflicts and disagreements over individual economic gains. The mechanical grater and press introduced at village level increased gaff productivity. The time needed for grating, considered one of the most laborious steps in the process, was greatly reduced. The dewatering step, which normally took five to eight days, was reduced to half an hour. The introduction of the gari processing machinery resulted in several adverse effects for the women in these areas. With the introduction of mechanical graters and presses, work traditionally done by women became the work of men. This transfer of control resulted in a transfer of income. Women lost an important income source. A set of four gari processing machines produced by a private Nigerian company were installed in one village in Bendel State. The system consisted of a cassava grater, dough sifter, mechanical press and garifier. Another component of the system, the peeler, was not bought. The factory employed 48 workers to operate the machinery. Eleven of these were women whose tasks were to hand peel the cassava tubers and keep the factory clean. Gari produced from this factory was of very high quality and was only sold in urban markets in places such as Lagos and Ondo. The sophisticated technology used by the factory is capable of producing very high-quality gari. The garifier has the dual purpose of toasting and drying; heat supply can be regulated. A cylindrical machine fitted with prodders for stirring enables the operator to avoid burns and eliminates contact with steam during stirring. The operations in the factory that were mechanized employed only male labour. Female labour was minimal and women were employed for a step in the process that was not mechanized. Women were employed for this work because available peeling machines in Nigeria were seen to be ineffective and women's labour was less costly. From these experiences in Bendel State, the introduction of improved gari processing technologies was seen to be more beneficial to the men in the area than to the women. At an intermediate level, the high capital cost of the machinery makes it unavailable to the women while at the same time pushing them out of this economic activity altogether. Source: Adapted from Williams, 1982. When interventions are planned to reduce the labour of traditional processing, the processing activity should be seen as part of a set of interlocking systems: first, a food system of growing, processing and marketing; second, an economic system of production and exchange of assets, including labour; and third, a social system of bargaining and responsibilities within the household and within the community. Evaluating the situation in this way may make it possible to assess more accurately who will benefit and who will lose from the introduction of improved technology. Box 49 summarizes the advantages and disadvantages of the introduction of grain mills at community level in five different projects in Africa under FAO's Special Action Programme for the Prevention of Food Losses. All mills were power operated; three projects introduced plate mills, while the other two introduced hammer mills. The problems encountered ranged from poor maintenance and frequent breakdown to complaints about the quality of the flour and social problems regarding mill management. The overall conclusion was that the mills were not economically feasible unless they were in use for at least 300 hours per year. This level of use would normally require a village target user group of at least 1 000 to 1 200 inhabitants and a sustainable supply of grain, with no major droughts affecting the local production system. The case-studies examined in this chapter exemplify the difficulties of reducing the labour involved in traditional processing and present some of the successful solutions to the problem. However, although food processing, especially pounding, grinding and milling, occupies a significant proportion of the working time of rural women, it is not the major labour in their working day. The time and effort spent in the collection of fuelwood and water dominate the waking hours of most rural women. A study in southern Tanzania showed that well over half of women's annual load carrying (in terms of tonnage) consists of fuelwood and water collection as an integral part of their food preparation work (Figure 26). Men spent only about 25 percent of the time women did in transport and performed approximately 11 percent of the load carrying. This heavy labour could be reduced through the extended provision of potable water and the introduction of more efficient cooking stoves, as well as through education in the health and safety dangers of physically overloading women with household transport tasks. Such improvements would make a considerable impact on the well-being of women and their children, in addition to optimizing their time and effort by freeing them for child care and more economically productive activities. The group responsible for the mill is in most cases a farmers' and most frequently a women's group. These mills are run by management committees and operated by a specially employed "operator". The advantages of a mill are the following. · It enables a reduction of workload for women, both in terms of energy and in terms of time. With the traditional way of milling it takes a woman 2 hours to mill a certain quantity of millet and 3.4 hours to mill the same quantity of sorghum. Women can occupy the time gained with collecting water and wood, trade, the children and resting. · The mill produces a better quality of flour. · Women learn to appreciate the benefits of communal effort. · If certain conditions are met, the mill can bring financial gain to the group. The following disadvantages were mentioned. · Quite number of farmers complain that the quality of the flour is not like that which they are accustomed to. · Women do not have the cash to pay for the milling. · Milling involves a certain cost, either in cash or in kind. Where it is not easily accessible, it ties up time which could be used more productively elsewhere. · The distance to the mill is often too long to allow for its use; 2 km seems to be a practical limit. · Financial management is often bad, so that no money is available for spare parts. · In some countries (e.g. the Gambia) it is reported that the female-dominated management committee, being new to the community, is not accepted, not even by the women themselves. · Mills break down frequently. A technical survey brought to light that at any time 37 percent of the mills are out of operation, mostly because of problems with the drive belts and shaft bearings. · Some groups (e.g. in Mali) are not able to make any profit because the variable costs cannot be kept in control. · Maintenance and accountancy are a problem. · The village élite may make decisions to its own benefit, since it is often overrepresented in the management committee and not all decisions are as democratic as could be wished for. · The milling charge is often much higher than that of private mills. · If the mill proves not economically viable, entire village groups can end up discouraged and (even worse) further indebted. Globally, an estimated 1500 million episodes of diarrhoea occur every year in children under the age of five years, and as a result over 3 million die. The serious nature of diarrhoea in infancy is discussed in more detail in Chapter 7. The majority of cases occur in developing countries, where it is estimated that up to 70 percent are of water- or food-borne origin. · poor quality control of industrial or cottage-industry food products. Source: Barwell, Howe and Zille, 1987 (quoted in Bryceson and Howe, 1992). An important element in the food marketing chain is the control procedures necessary to ensure that the food - whether raw, semi-processed, manufactured or prepared - is safe, of high quality (meeting established official standards and buyers' expectations) and nutritionally sound. Implementing food control practices to ensure food safety, quality and nutritional value is of paramount importance. Food moving in international trade must meet established international food standards, i.e. those set by the Codex Alimentarius Commission (see Box 50). Much of the responsibility for food safety lies in the hands of women, who have a major role in food production, procurement, processing, preparation and presentation at both the market and household levels. A substantial proportion of transmission of food-borne disease occurs in the home, so the education of those involved in domestic food preparation is of crucial importance. Some fundamental rules for domestic food safety are given in Box 51. Standards for food composition, quality and safety have been developed and applied over many years to protect consumers and to eliminate unfair trading practices. The largest number of such standards is contained in the Codex Alimentarius, a collection of food standards, codes of hygienic practice and other recommendations prepared by FAO and WHO through the Codex Alimentarius Commission. Codex Alimentarius simply means "food code" in Latin. The Codex food safety and quality standards are recognized internationally by the World Trade Organization as the basic reference points for internationally traded food commodities. Food that conforms to Codex requirements can be freely traded between countries. Codes of hygienic practice developed by the Codex Alimentarius Commission, which protect consumers from mishandling and poor storage of food. can also be applied to locally traded commodities such as street foods. A special code has been developed for application in the Africa region. Codex standards and codes cover hygiene, labelling, the use of chemical additives (such as colourants), pesticide residues and many other factors important in ensuring the protection of consumers and fair practices in the food trade. Environmental improvements related to food safety, housing, water supply and sanitation are important steps towards preventing infection. Such improvements may well occur independently of any improvement in socio-economic status, but nutrition and health benefits are unlikely to be realized without an improvement in socioeconomic status. Primary education can have an important role in improving nutritional status by stressing basic nutrition principles, including dietary diversification, and basic food safety practices that minimize the risk of food contamination. · Eat meals as soon as possible after they are cooked, so that bacteria do not have time to breed. · Use a safe water supply if possible. If not, boil drinking-water for babies for at least three minutes. Boil the drinking-water for the whole family if there is an epidemic of diarrhoea or cholera in the area or if the water quality is doubted. - especially after you pass faeces or clean a baby's bottom or touch animals or soil. · Use a toilet and keep it clean. If small children pass faeces on the ground, put the faeces into the toilet and then wash your hands. Then flies and other pests cannot reach the faeces and get bacteria on their legs. · Keep food covered, especially cooked food and food for children, so that dust cannot fall on it and flies with bacteria on their legs cannot land on it. Covering with a cloth may allow food to cook more quickly than covering with a plate, so bacteria have less chance to breed. · Cook food very well so that you kill any bacteria or worms in the centre of the food. - if possible heat the food again just before you eat it, so that the centre of the food is boiling or very hot. - cover the utensils with a cloth if the area is dusty. Source: King and Burgess, 1993. In urban areas food habits include higher consumption of processed foods and of meals and snacks that may be prepared and marketed under unhygienic conditions which can lead to food contamination. Studies on street foods carried out in Nigeria (FAO, 1991a), Uganda (FAO, 1992a) and other countries (FAO, 1992h) noted that freshly cooked foods were generally free of bacterial contamination but that some ready-cooked foods such as meat and milk products and ice-cream were often found to be contaminated. Water handling practices also contribute to contamination; food and beverages may be contaminated during their preparation, and serving plates and dishes during washing. Inadequate environmental conditions associated with a lack of sewage and garbage disposal were an additional factor in the possible transmission of food-borne infections, as were the personal health and hygienic practices of the food processors and vendors. Both producers and consumers of street foods would benefit from appropriate training in food hygiene and sanitation. The provision of safe water for food preparation and utensil washing and the provision of clean surroundings to reduce environmental pollution are required to improve street food quality and safety. Improvements in food preparation, handling and vending practices would assist in preventing food contamination and in protecting the health of the consumer. Official recognition of the street food sector by local and/or national authorities will assist in organizing the street food sector, will provide vendors with legal and administrative facilities to develop their businesses and will encourage the use of improved food handling practices. The above sections call for greater priority to be attached to aspects of storage, processing and marketing of foods. Priority areas for action include increased awareness by government of the importance of the post-harvest sector with regard to the contribution it makes to household food security and improved nutrition in both rural and urban areas. An effective food processing, distribution and marketing system will require an appropriate and well-maintained infrastructure, including markets, road networks and extension services to advise farmers on improved storage techniques or on how to bulk their produce as a group to reduce marketing costs. This requires interventions by both government and the private sector, which could work hand in hand in the establishment of marketing information systems and training in marketing management, accounting and business methods. With regard to the special needs of the many women involved in food processing and marketing, governments can assist by providing information and training on the use of appropriate processing technology and by providing extension support for marketing of fresh and processed produce.